London is the hotbed for English talent this millennium, according to a Sky Sports study. In total, 50 England stars that have played since 2000 were born in London, with Jadon Sancho being the most recent debutant from the capital. That number could be boosted further if London-born duo Callum Hudson-Odoi and Declan Rice make their debuts in the upcoming European Qualifiers. The North West has the second-highest number with 46 representatives since the turn of the century, including England's all-time leading scorer Wayne Rooney. Then there is a big drop to the next region, with 21 players born in the South East, followed by Yorkshire and the Humber with 17 players. 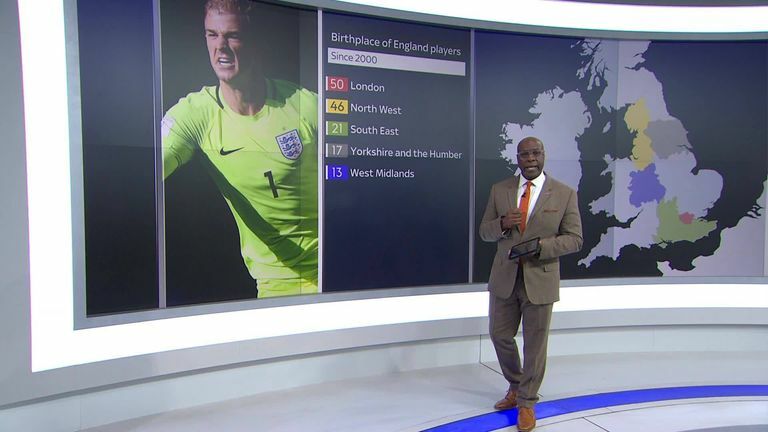 Goalkeeper Joe Hart is one of 13 players born in the West Midlands, while 11 players came from the East of England - including Cambridge-born Nick Pope and Manchester United's Ashley Young. Another 11 were born in the North East, including Jordan Pickford, Jordan Henderson and, of course, Alan Shearer. Five were born in the East Midlands: Leicester-born Emile Heskey and Chris Kirkland and Nottingham trio Tom Huddlestone, Jermaine Jenas and Andy Cole. The South West has produced only three England players, while five have come from abroad - including Jamaica-born Raheem Sterling and Owen Hargreaves, who was born in Canada. The findings restore parity to an all-time trend published in a Sky Sports study two years ago, which revealed northern England had produced twice as many internationals than the south since 1872. Over the past 147 years, there have been 817 England internationals born in the five northern regions, compared with just 378 born in the south - while 39 were born abroad and the birthplaces of six others were unidentified.